Although many vector-borne diseases are important causes of morbidity and mortality in dogs in tropical areas and potential zoonoses, there is little information on these conditions in Central America. Seven qPCRs for vector-borne pathogens were performed on a Roche LightCycler PCR Instrument to investigate their prevalence in a convenience sample of whole blood samples from apparently healthy dogs in Nicaragua. Also, a qPCR targeting the canine hydroxymethylbilane synthase (HMBS) gene was used as an endogenous internal control and verified the quality and quantity of DNA in the samples was appropriate for the study. We found DNA of Rickettsia felis (5%), Babesia spp. (26%), Hepatozoon canis (51%), Anaplasma platys (13%) and Ehrlichia canis (56%) in the 39 dogs studied. The qPCRs for Coxiella burnetii and Dirofilaria immitis were negative. Of the 30 (80%) dogs that were positive by qPCR, 12 (31%) were positive for one agent, 11 (28%) for two, 3 (8%) for three, and 4 (10%) for four agents. This is the first report of B. gibsoni in dogs from Central America and the first recording of vector-borne agents in dogs from Nicaragua. Dogs in Nicaragua are commonly infected with a variety of vector-borne pathogens, some of which may also infect people. Vector-borne agents are important causes of morbidity and mortality in dogs worldwide [1–4]. Many cause zoonoses and the close relationship between people and their dogs facilitates human infections. Knowledge of the prevalences of canine vector-borne disease is thus important for veterinarians and their patients as well as for workers in the public health field . There is only very limited data on vector-borne diseases in dogs from the seven Central American states with reports from only three countries, mainly Costa Rica [6–8], Panama [9–11] and Guatemala . To provide further data on canine vector-borne diseases from the region, we investigated a convenience sample of dogs from Nicaragua and describe the findings in this report. This study was approved by the Institutional Animal Care and Use Committee of the Yangzhou University College of Veterinary Medicine of China. Convenience samples of whole blood were collected into EDTA from 39 apparently healthy dogs presented at a neutering program operated by Volunteers for Intercultural and Definitive Adventure (VIDA, sites.google.com/site/rusvmvida) in April 2012. The dogs belonged to local people from underprivileged areas in Rivas, a city situated in Southwestern Nicaragua. Verbal permission was received from the owners of the dogs for blood to be used in the study. The whole blood samples were stored at 4°C for 2–3 days before aliquots (200 μL) were frozen at -80°C until DNA was extracted as described below. The High-Pure PCR Template Preparation Kit (Roche Molecular Biochemicals, Indianapolis, IN, USA) was used to extract total nucleic acids from the whole blood aliquots as described previously . Each extracted DNA was eluted in 200 μL elution buffer and stored at -80°C for qPCRs. Eight qPCRs, seven for tick-borne pathogens and one for the canine HMBS gene as an endogenous internal control, were performed on a Roche LightCycler 480-II PCR Instrument. The qPCRs were performed as described previously for R. felis, Babesia spp. , Hepatozoon spp. , Anaplasma spp. , E. canis, C. burnetii and the canine HMBS gene . The PCR products were verified by gel electrophoresis and nucleotide sequencing using forward and antisense primers (GenScript, Nanjing, China). The Clustal Multiple Alignment Algorithm was used to compare the GenBank sequences of the 5.8S rRNA of D. immitis (AF217800,EU087700, EU182331.1, EU182328, AF217800)and the following primers and probes were designed specifically for D. immitis and validated: sense primer: 5′- TTCAATAACTCTAAGCGGGGGATCACCT-3′; anti-sense primer: 5′- TCTGATCGATATTGACCCTCAACCAGAC-3′; 6-FAM probe: 5′-TGCAGACGCATTGAGCACAAAGATTTC-(6-FAM)-3′; LCRed 640 probe: 5′-(LCRed-640)- AATGCACATTGCACCATCGGGTTGA-(Phosphate)-3′. The hybridization temperature of the qPCR was found to be optimal at 58°C and the thermal cycling protocol was as described previously . A 172-bp nucleotide fragment representing the canine D. immitis 5.8S rRNA gene sequence was synthesized and inserted in the pIDTSMART cloning vector (Integrated DNA Technologies, Coralville, IA, USA) and used as the quantitative standard for the D. immitis qPCR. The DNA products were quantified using the PicoGreen® DNA fluorescence assay (Molecular Probes, Eugene, OR, USA) and the number of target molecules was calculated. Logarithmic dilutions of the DNA products were used to determine the sensitivity of the D. immitis qPCR, which was verified by gel electrophoresis and nucleotide sequencing (GenScript, Nanjing, China). The gene copy numbers determined by qPCRs were logarithmically transformed for statistical analysis using the Kruskal-Wallis non-parametric ANOVA. The limited time available for the neutering program meant we were unable to carry out detailed investigations of the ticks found on the dogs. The overall impression, however, was that ticks were common and consisted mainly of R. sanguineus group. There was no regular use of acaricides for ticks and control was mostly by manual removal when tick burdens were high. The qPCR for the HMBS gene was positive on all samples with 2.1 × 106 ± 8.8 × 105 copies/ml whole blood, indicating successful extraction of amplifiable DNA from all samples. The qPCR we developed for D. immitis consistently gave positive results with the quantitative standard we synthesized. Using the standard we found we could detect a single copy of the 5.8S rRNA gene in a qPCR reaction. We obtained positive qPCR results for 5 of the 7 organisms we tested. Only D. immitis and C. burnetii gave negative qPCR results in all the dogs we examined. D. immitis is the agent of canine heartworm disease which is transmitted by mosquitoes and an important cause of lung and heart pathology in dogs worldwide . There is only one report on the disease from Central America where just 2% of dogs studied in Costa Rica were seropositive , considerably less than that from the nearby USA where seroprevalences may be up to 49% . Absence of animals positive by qPCR in our study could reflect the small sample of dogs we tested or represent a more generalized low level of infection. Further studies are needed to determine the true status of D. immitis infections in Nicaragua. C. burnetii is the agent of Q fever in people, a disease reported to occur worldwide, apart from New Zealand . Sources of human infections are generally domestic ruminants although cats have been implicated in some outbreaks  and dogs in only one . There are no reports of C. burnetii in people or animals in Central America and we found no evidence of infection in dogs. Using PCR, however, is not a sensitive method to detect C. burnetii exposure in dogs or its presence in an area. In the only other survey for C. burnetii in dog blood which was conducted in Hungary, just 1/123 samples was PCR positive despite 25 being seropositive . To determine the importance of Q fever in Central America, studies are needed on people and livestock which are the major reservoirs of infection. The most common infectious agent we detected was E. canis (22/39; 56%) with an average of 84 copies of the 16S rRNA gene/ml whole blood (SD 71; range 50 ~ 313) (Figure 1). This prevalence is similar to the 47% (148/310)  to 34% (50/146)  reported from Costa Rica in the only other PCR surveys of dogs in Central America, and these findings suggest the organism is prevalent in the region. Infections with E. canis cause canine monocytic ehrlichiosis with 80% of dogs developing prolonged thrombocytopenia [26, 27]. We were unable to carry out hematological examinations on our study dogs but, despite the high likelihood that some were thrombocytopenic, all the surgeries were uneventful and no abnormal bleeding tendencies were noted. Gene copy number of five vector-borne pathogens in canine whole blood samples. Quantitative FRET-PCRs determined the gene copy number of five tick-borne pathogens. 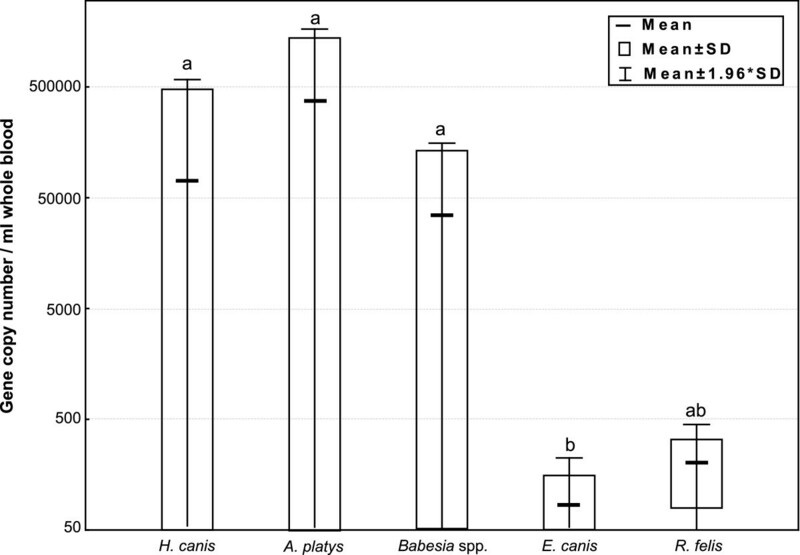 The rRNA copy numbers for E. canis (84 ± 71 /per ml whole blood; range 50 ~ 313) were significantly lower than those for H. canis (72,120 ± 260,148), A. platys (370472 ± 659438; range 651 ~ 1534409), and B. canis (35161 ± 61,335; range 72 ~ 199,552). The gltA copy number for R. felis (204 ± 125; range 116 and 292) was not significantly different from the rRNA copy number of the other four tick-borne agents. The Y-axis is shown as logarithmic scale, and the data were shown as average gene copy number (-), mean ± SD (□) and mean ±1.96 × SD (Ι). E. canis is transmitted by the Rhipicephalus sanguineus group which occurs worldwide . There is no vaccine for E. canis and only tick control can prevent infections. Unfortunately, R. sanguineus group is notoriously difficult to control even with expensive modern acaricides and applicators. Diagnosing infections is also challenging as, although organisms can be seen in stained blood smears, microscopy is rarely successful and diagnoses are usually made with expensive serology and/or PCRs. Even when diagnoses are made, treatment failures are common in naturally infected dogs [17, 29], most probably as a result of inadequate tick control and re-infection. The difficulties associated with tick control, diagnosis and treatment mean that in underprivileged areas infections with E. canis will be particularly difficult to control and canine monocytic ehrlichiosis can be expected to remain prevalent in these areas. Although apparently uncommon, E. canis can infect people  and health workers in Central America should be aware of the high prevalence of ehrlichiosis in dogs and the possibility of infections in their patients, particularly those with a history of tick bites [8, 9, 31]. Infections with H. canis were also very common in our study (20/39; 51%) with an average 18S rRNA copy number of 72,120/ml whole blood (SD 260,148; range 3 ~ 1,171,720) (Figure 1). A lower infection rate was found in Costa Rica (11/146; 8%) in the only other investigation of the organism in Central America . Infections have also been reported from Africa, Southwestern Asia, Southwestern and Eastern Europe and North and South America , indicating a worldwide distribution of the organism. This is expected as the main vector of H. canis is R. sanguineus group , which occurs worldwide . Most infections are subclinical, but in some dogs (15%) there is high parasitemia and clinical signs including fever, weight loss, anemia and hyperglobulinemia . Many dogs have concurrent infections with vector-borne agents such as E. canis and Babesia spp., and deciding each agent’s contribution to signs is difficult. Various treatments have been used but none are fully effective . The predominant Babesia spp. in dogs are B. gibsoni, B. canis, B. vogeli, and B. rossi[35–37]. In our study we found 26% of the dogs (10/39) had DNA of Babesia spp. with an average 18S rRNA copy number of 370,472/ml whole blood (SD 659,438; range 72 ~ 199,552). Melting point analysis and genomic sequencing showed four of the 10 dogs to be infected with B. gibsoni (Tm ~67°C) and six with B. vogeli (Tm ~58°C). None of the dogs were infected with both species or with B. vogeli or B. rossi. B. gibsoni is found in northern Africa, southern Asia, Australia, Europe, the USA and the Caribbean  and ours is the first report of the organism in Central America. The organism is thought to be transmitted by fighting or by ticks, in particular R. sanguineus group . There are no reported human infections  but in dogs infections usually result in acute signs including fever, pallor, splenomegaly and anorexia . Dogs that recover from the acute infection generally become chronic subclinical carriers with significantly reduced platelet counts . Diagnosis is by detecting organisms in stained blood smears but in chronic cases organisms are seldom seen and serology or PCR are needed . As with canine ehrlichiosis, treatment of B. gibsoni is difficult and often the parasite is not eliminated . The other Babesia spp. we detected, B. vogeli, has been reported from Central America with 8% of 146 dogs studied in Costa Rica being positive . This organism is transmitted by R. sanguineus group, with infections being subclinical or causing only mild signs with anemia and thrombocytopenia . It has also not been reported to infect people . Only a few dogs (5/39, 13%) carried A. platys DNA with an average of 370,472 copies of the 16S rRNA gene/ml whole blood (SD 659,438; range 651 ~ 1,534,409). This is similar to the prevalence reported in Costa Rica (14/146: 10%)  and indicates the organism is probably widely distributed in Central America, as it is elsewhere in the world. A. platys is probably transmitted by R. sanguineus group and is the agent of infectious canine cyclic thrombocytopenia . There is only a single report of an infection in a person . Although infections in dogs are often subclinical, infected dogs might be thrombocytopenic. Platelet numbers might be lower with coinfections with other vector-borne agents, in particular E. canis and Babesia spp. [17, 44]. Although organisms can be seen in peripheral blood smears, the most sensitive diagnosis is by serology or PCR . Treatment with doxycycline has been reported to sterilize infections . The least common agent we detected was R. felis (2/39, 5%) with gltA copies of 116 and 292/ml of whole blood (SD 125; range 116 ~ 292). This is an emerging pathogen principally associated with cat fleas (Ctenocephalides felis) and responsible for flea-borne spotted fever in people . The organism occurs on all continents except Antarctica and has been reported in cat fleas from Guatemala, Costa Rica and Panama in Central America [9, 47, 48]. Recent evidence has indicated dogs might be reservoir hosts for the organism although infections seem to be subclinical . Infections in people can cause clinical signs ,which are generally mild and consist of fever, headache, myalgia and rash . In Africa, infections appear common with up to 6% of febrile patients in Kenya and Senegal reported to be PCR positive for the organism . Although no clinical cases have been reported from Central America, R. felis appears to be widespread in the area and health workers should be aware of the possibility of flea-borne spotted fever in patients with a history of contact with fleas. In the 80% (31/39) of dogs we studied which had DNA of a vector-borne agent, mixed infections were very common with 11 (28%) having evidence of two agents, 3 (8%) having evidence of three, and 4 (10%) of four agents (Table 1). The most common multiple infection was with H. canis and E. canis (7 dogs) with infections with H. canis, E. canis, B. vogeli and A. platys being second most common (3 dogs). There is little detailed data on mixed infections and how one agent may exacerbate [8, 17, 44] or ameliorate  the effects of another, which greatly complicated clinical diagnoses. Also it means that in many dogs multiple drug therapies are needed to cure animals and resolve hematological and biochemical abnormalities. “-”denotes the absence of examined DNA in the whole blood of the designated dog. It is particularly noteworthy that many of the pathogens we found cause thrombocytopenia in apparently healthy dogs. The infections are often difficult to diagnose without expensive serology and/or PCR, and treatment is often unsuccessful which poses major problems to local veterinarians carrying out surgeries and organizations carrying out neutering programs in underprivileged areas. Finding innovative and inexpensive methods for parasite and vector control on dogs appears to be the best way forward for controlling these vector-borne pathogens of dogs and people. The nucleotide sequences of the PCR amplicons we obtained for the five vector-borne pathogens we detected were identical to those reported previously. The sequences of the R. felis, B. gibsoni, B. vogeli, H. canis, A. platys and E. canis amplicons were the same as those reported in GenBank for organisms from Brazil (Gene Accession #JF694092), St. Kitts (JX112784), St Kitts (JX112785), Brazil (KF692040), South Africa (KC189854) and the Czech Republic (KC479024), respectively. Comparisons of the average gene copy numbers of the five vector-borne pathogens we studied showed the rRNA copy numbers for E. canis were significantly lower than those for H. canis, B. canis and A. platys (Figure 1; Kruskal-Wallis non-parametric ANOVA). This probably reflects the fact that E. canis occurs in monocytes which are in lower concentrations in the blood than neutrophils, erythrocytes and platelets in which the other organisms are found, respectively. The gltA copy number for R. felis was not significantly different from the rRNA copy number of the other four tick-borne agents. Our study has added to the scant data on canine and zoonotic vector-borne agents in Central America. We provide the first data on these organisms in dogs in Nicaragua and the first report of B. gibsoni in Central America. The available data from our study and the few others performed in the region suggest vector-borne diseases of dogs are common and widespread and in need of further investigation. Also, many of the pathogens can infect people and health workers need to be aware of this possibility, particularly in patients that have contact with dogs and their parasites. This project was supported by grants from the National Natural Science Foundation of China (NO: 31272575), the Ross University School of Veterinary Medicine and the Molecular Diagnostic Laboratory of Auburn University College of Veterinary Medicine. The authors sincerely appreciate the Intercultural and Definitive Adventure (VIDA) in sample collection for this study, and Xiaojing Zhu, Yongpeng Zhang and Lei Jiang from Yangzhou University College of Veterinary Medicine for their technical help. LW, PK, BK and CW designed the experiment, monitored the study and interpreted the results. LW, KA, JZ and HSE performed the experiment. All authors read and approved the final version of the manuscript.